I’ve been a bit behind in blogging and I can’t say I have any good reasons why. I’ve been lazy about taking pictures of my current projects and then when I have taken pictures, I forget to edit and upload them. I think I’ve also been side tracked with getting everything in order for two upcoming trips. Ah well. I’ve definitely been knitting despite not blogging about it! Since I last posted, I’ve finished two projects. 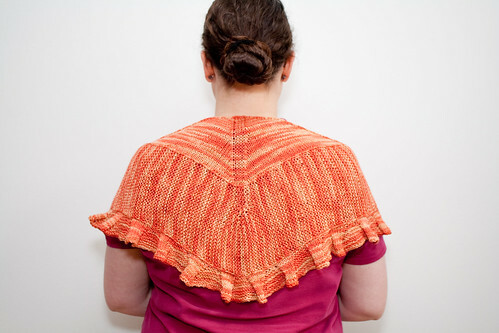 The first thing I finished was my third sweater for the year, Cassis. Notes: I added waist shaping at the sides, did long sleeves instead of short sleeves, and shortened the length. Overall I’m still feeling a bit “meh” about this sweater, but it does make a nice, washable house sweater or sweater to keep at work for when it’s a bit chilly. After I finished up Cassis, I focused on finishing High Road since I was already pretty close to being done. A day later I was binding off High Road and blocking it! Notes: Knit as written, though my gauge may have been a little off (I honestly don’t check for shawls). Very interesting construction and the whole thing seemed to go pretty quickly with first knitting the middle section, then the middle to top, then the bottom ruffle. I enjoyed working with the yarn as well. Squishy and soft and such a pretty colorway! First thing I cast on was another sweater. 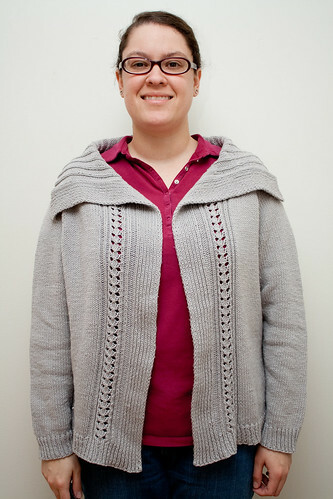 After all, this is The Year of the Sweater for me with my goal of knitting 12 sweaters in 2011. With 3 under my belt, I think I’m doing pretty good and feeling like I can definitely make it. Even with other projects going on, I’ve stayed with my goal of a sweater a month and not casting on a new sweater until the one I’m working on is done. 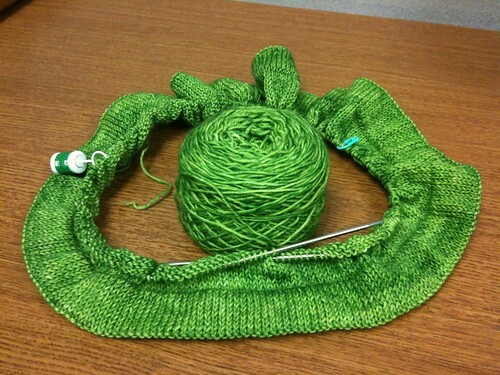 I’ve been itching to use the Vesper Quick Sock in Ivy League ever since my first attempt at Bel Air didn’t work out. After finishing Cassis, I was hesitant to try Bel Air again because of the collar. Turns out I don’t really like the collar on Cassis much and was afraid I wouldn’t like the one on Bel Air (in hindsight, I think it would be fine since it isn’t big like the one on Cassis, so Bel Air is still in my queue). After some swatching and pattern searching, I decided on Slipped Hours. I downloaded the pattern and immediately noticed something. There is no schematic that comes with this pattern. Now, that may not be an issue for some knitters, but it is for me. When I first started knitting sweaters, I didn’t think a whole lot about the schematic or how the end product would actually fit my body. After I’d knit a few sweaters, I found a few things “wrong” with them – something was too long, too short, or just didn’t fit me well. This is when I learned to read the schematic and really pay attention to it when I knit a sweater so that I would be happier with the end result. I must admit, it has definitely helped. Most importantly, it helps me choose a size that will fit the way I want it to fit rather then going solely by the sizing stated in the pattern like I did those first few sweaters. This is the third sweater pattern in as many months that I’ve purchased that doesn’t have a schematic and I admit I was really irritated and disappointed that I paid for yet another pattern without a schematic. In my opinion (and those of other knitters I have asked), a sweater pattern that you pay for should come with a schematic. I swear, I’m not even that picky about it and if it were a free pattern, I wouldn’t even mention it not having a schematic (after all, it’s free). I don’t expect everyone to be a great artist (I know I’m not!) and I would totally accept something a designer drew in MS Paint with all the appropriate measurements of the finished garment. Just something that I can look at and go “Okay, if I picked ___ size it will be…”. I have never designed a sweater pattern and put it up for sale, but from what I know of sweater construction, designing, and pattern writing, a designer does do the math to figure out sizing and instructions. It seems reasonable that with all that math done for the sizing that it wouldn’t be much to add a small picture of a sweater with measurements for it since those are already known because of the pattern writing for various sizes, right? To me, it seems totally reasonable, but I digress. With no schematic to look at so I could cast on right away, I took a few days to think it over, draw my own schematic, figure out how to add waist shaping, and figure out which size I wanted to knit. Ultimately I went with the largest size. I decided not to do reverse stockinette on the turned hem and just did regular stockinette on a smaller needle (pattern states to do it on the same needle you use for the body), did a purl row for the turn row, then switched to the needle that I got gauge for the body with. I’ve finished the hem and I’m into the waist decreases for the body. One of the trips coming up involves a formal dinner and I’ve cocktail dress dress I like, but it only has one shoulder strap. 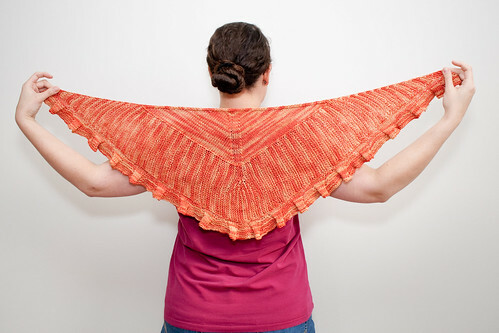 I’m a bit worried I might get chilly, so I figured I’d knit myself a shawl to go with it. Finally decided on yarn (Wollmeise sock yarn in Fuchsia) and decided to knit Elektra. I was on the fence about the beads, but decided they’d be a fun addition since I don’t often knit things with beads and I thought it would add a little sparkle to the shawl. 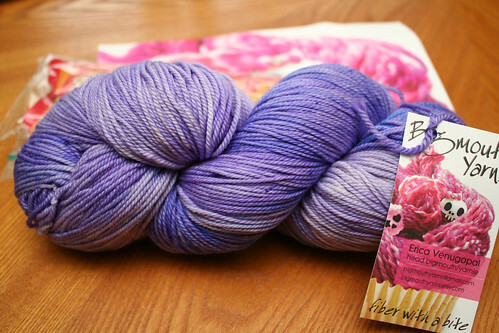 I looked locally, but was unable to find anything to match the yarn that I liked, so I ordered from Fire Mountain Gems. 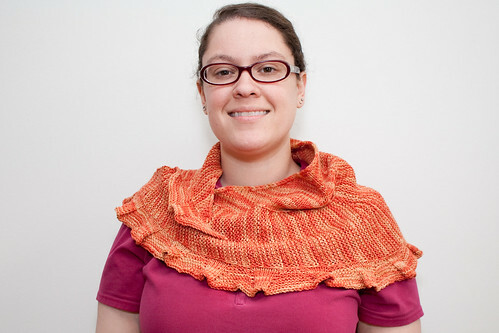 Hopefully those will arrive this week and I can get started on the shawl soon. Over the weekend I decided to cast on for another project. I suddenly had the urge to knit up this purple sock yarn that has tried and failed to be a project many times over. Immediately, I thought of the pattern Rook. I’ve been wanting to make these and this yarn was calling for me to knit it, so I cast on. I’ve got half of the first mitt finished and it fits great. I was a little worried about gauge since that had been an issue in previous projects when I’d used this yarn, but it seems to be spot on for this pattern. No pictures yet. Instead I’ll show you the yarn I’m using! I would totally be upset if a pattern i paid for didn’t come with a schematic. Goodness, wouldn’t having one help the designer write it?? You have been very busy!!! It’s a very good point you make about schematics. My brain thinks I’m a different size than what I actually am and a schematic really helps me pick the right size. And you get a better of idea of if you need to customize and where you need to do it.